Swiss Re reported net income of USD 4.4 billion for 2013, compared to net income of USD 4.2 billion in 2012. Earnings per share were CHF 12.04 or USD 12.97, compared to CHF 11.13 (USD 11.85) in 2012. The Group results in 2013 reflected a very good underwriting result along with favourable prior-year reserve development, investment gains and one-time tax benefits. Net income for Reinsurance was USD 3.6 billion compared to USD 3.7 billion in 2012. Property & Casualty accounted for USD 3.3 billion (compared to USD 3.0 billion in 2012), while Life & Health accounted for USD 356 million, compared to USD 739 million in 2012. In 2013 a lower investment result and reserve strengthening for group disability business in Australia were largely offset by one-time tax benefits. Corporate Solutions delivered net income of USD 279 million compared to USD 196 million in 2012. 2013 reflected continued profitable growth. Admin Re® reported net income of USD 423 million compared to USD 183 million in 2012. The 2013 result was due to a better investment performance and the positive effect of changes in UK tax. The 2012 result included a USD 399 million loss relating to the sale of the Admin Re® US business. The Group combined ratio was 85.3% in 2013, compared to a combined ratio of 83.1% in 2012. The 2013 result was driven by higher natural catastrophe losses, although lower than expected, and higher man-made losses, partially offset by positive development on prior-year reserves. Return on investments was 3.6%, compared to 4.0% for 2012, with the difference mainly attributable to lower realised gains in the current year. Shareholders’ equity decreased to USD 33.0 billion at the end of 2013 from USD 34.0 billion at the end of 2012 reflecting the ordinary and special dividends to shareholders and unrealised losses on investments driven by increasing interest rates, partially offset by the strong net income for the year. Return on equity was 13.7% for 2013 compared to 13.4% for 2012. Book value per common share decreased to USD 93.08 or CHF 82.76 at the end of 2013, compared to USD 95.87 or CHF 87.76 at the end of 2012. Book value per common share is based on common shareholders’ equity and excludes non-controlling interests and the impact of contingent capital instruments. For information on segment shareholders’ equity, please see Note 17. Premiums earned for Property & Casualty Reinsurance were USD 14.5 billion or 18% higher compared to 2012, mainly driven by the expiry of a quota share retrocession agreement at the end of 2012 and new business written in the Americas. Life & Health Reinsurance premiums and fees increased by 10%, primarily driven by the business recaptured in the first quarter of 2013, rate increases in the yearly-renewable term business, growth in health premiums in Europe and new business in Asia. Corporate Solutions premiums earned increased 28% to USD 2.9 billion, reflecting organic growth across most lines of business and the expiry of the quota share retrocession agreement mentioned above. The Group’s non-participating net investment income decreased to USD 3.9 billion, compared to USD 4.5 billion in 2012, largely driven by the impact of the sale of the Admin Re® US business in 2012. The Group running yield was 3.2% in 2013, in line with the prior year. The Group reported non-participating net realised investment gains of USD 766 million in 2013, mainly as a result of gains from the sale of investments related to the re-balancing of the investment portfolio and active management of the listed equity portfolio. This compares to USD 947 million in the prior year, which included significantly higher realised gains from the sale of government bonds offset by losses related to the sale of the Admin Re® US business. 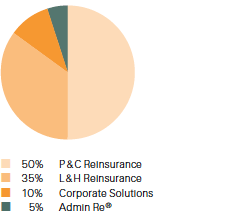 The Property & Casualty Reinsurance combined ratio was 83.3% compared to 80.7% in 2012. The ratio increased due to higher man-made losses and lower net reserve releases from prior years. The Corporate Solutions combined ratio for 2013 was 95.1% compared to 96.2% in 2012, mainly driven by continued profitable growth across most lines of business and lower natural catastrophe losses. Both periods benefited from positive prior-year development. Life & Health Reinsurance benefits increased 19% to USD 8.1 billion over 2012 reflecting higher business volumes, the impact of business recaptured in the first quarter of 2013 and reserve strengthening for Australian group disability business. The operating margin was 5.2% in 2013 compared to 8.6% for 2012, and the decrease was primarily due to the items mentioned above. Return credited to policyholders reflected the investment performance on the underlying assets, mainly backing unit-linked and with-profit policies, which are passed through to policyholders. In 2013, an investment gain of USD 3.7 billion was passed through to policyholders compared to a gain of USD 3.0 billion in the prior year. Acquisition costs for the Group increased to USD 4.9 billion reflecting higher business volumes and the impact of the recapture of retrocessions. Administrative expenses were USD 3.2 billion, 8% higher than in the prior year mainly due to the implementation of strategic growth initiatives. Other expenses were USD 349 million. Interest expenses were USD 760 million, 3% higher when compared to 2012. The Group reported a tax expense of USD 312 million on a pre-tax income of USD 4.8 billion in 2013, compared to an expense of USD 1.1 billion on a pre-tax income of USD 5.5 billion for 2012. This translates into an effective tax rate in the current and prior-year reporting periods of 6.5% and 20.4%, respectively. The particularly low effective tax rate in the current year mainly reflects the conclusion of audits, rulings and revised tax opinions and the enactment of lower tax rates and the transition to a new tax regime in the UK.